Critics everywhere look forward to the annual Television Critics Association summer press tour to get an idea of what the TV landscape will look like in the fall. However, this year they’ll have to do without producers from AMC’s “The Walking Dead” as they’ll be busy attending the funeral of a friend to the show. According to The Wrap, AMC released a statement to the press apologizing for the fact that no one from “The Walking Dead” would be in attendance and offered to facilitate interviews at a later date. However, those behind the show thought it was a much better use of their time to attend the funeral of stuntman John Bernecker, who died earlier this month after an on-set accident. As The Hollywood Reporter notes, in addition to Gimple, creator Robert Kirkman was supposed to be there along with executive producers Gale Anne Hurd, Dave Alpert and Greg Nicotero. However, it’s unclear if all of them are planning to attend the funeral. 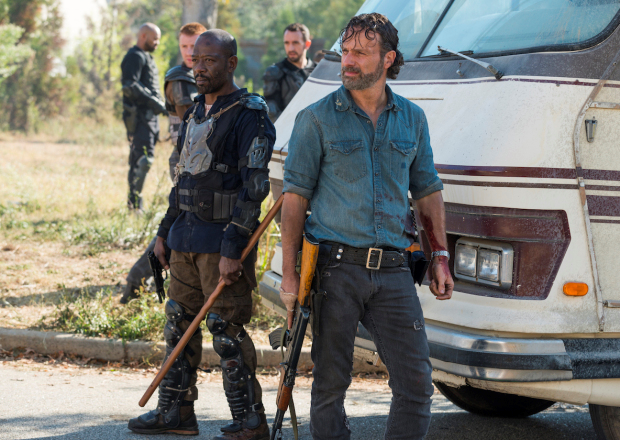 Fortunately, the TCA press tour comes just after the San Diego Comic Con, where “The Walking Dead” not only gave some hints about what to expect in Season 8 and the 100th episode, but debuted the new trailer for the upcoming season as well. It’s also worth noting that the group came close to canceling its Hall H panel at the event, but instead opted to eulogize Bernecker in front of fans before debuting the trailer that they said he, and everyone else there, had worked so hard on.